I am not exclusively a roleplayer, though it is the most frequent thing that we play when my group meets. But, we also play wargames and whilst it happens less frequently, we have, on occasion replaced our rpg sessions with figures wargaming, sometimes for year long campaigns. Peoples who knew me from my old Brabantini yahoogroup know that I make my own paper figures (and that I also use those from my favorite figures artists). All this means that I have a collection of paper figures and 3d (mostly) paper scenery. So, why not use those in my TFT campaign? Of course, there will be no hexgrid on the table, even no grid at all, but that is certainly not a problem. Paper figures and scenery have a lot going for them: cheap, easy to store and produce (easier anyway than painting and assembling lots of lead and plastic figures and scenery), particularly if you use an automated cutter (the main reason I am back into paper figures). Figures must be mounted on appropriate bases. If using paper figures, glue them on card bases or if you prefer non permanent bases, use the litko bases (that's what I am using now). Alternatively you can use One-Monk style basing, it is available HERE, and a lot of figures sets available on the web include variations of it. 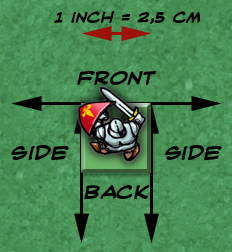 First, TFT uses the orientation on the map for determining the front, side and back of the character. It can be quite easily translated into figure gaming by using standard squares bases. To find from which side an attack comes, find in which direction the center of the attacker's figure front falls. And, to be able to attack an enemy, the target must be in the attacker's front arc. Simple, No? To measure distances and movements, we must translate the hexes used in the game into units measurable on the table. That's quite self evident: distances in hexes are just used as inches on the table. TFT also uses a specific unit of distance/surface called a megahex. It is simply represented by a hex and the hexes around it. So, it is not very difficult to translate them on the tabletop. - A character's own's megahex: use a one inch area around the figure. - An area of one or several megahexes: Use a template 3 inches in diameter. - A distance in megahexes: each 1 megahex distance equals 3 inches on the table. As I said in an earlier post, my philosophy for my TFT campaign is that what works works. So I am not going to prepare all that I need to play a scenario specifically in 3D. If I already have what is needed, fine, if not, a battlemap and tokens on Maptool or Roll20 are also fine. Or figures on a sketch map drawn directly on a paper tablecloth for that matter. Whilst it can add some flavour to a game, the physical representation of the action is not the important part. What matters is the action itself.